Radical Landscapes questions the aesthetic frameworks within which we encounter and understand landscape, exploring why and how we remake landscape in and through language. Radical Landscapes takes its name from the title of Harriet Tarlo’s seminal collection The Ground Aslant: An Anthology of Radical Landscape Poetry (Shearsman, 2011) - the first of its kind to showcase innovative British ecopoetries. This exhibition pushes the application of this term beyond page-based poetics positioning it firmly between literary and fine art treatments of landscape. In September 2017, Judy Tucker curated In The Open, one of the largest exhibitions of contemporary innovative language and landscape work in the British Isles to date, for the biennial ASLE-UKI conference in Sheffield. Radical Landscapes builds on the precedents set by Tarlo & Tucker to explore the continuum between drawn, painted, written, collaged and projected marks in the construction of landscape. The Main Gallery is officially open Tues - Sat 10am - 5pm. If you would like to visit outside those times please contact box office on 01805 624624 and they will let you know if it is possible. It is often open in the evenings and Sunday/Monday but sometimes there are events and meetings. Testing the effect of the word ‘love’ on water (as in the work of Masaru Emoto) I place A Little Treasury of Love Lyrics** close to a stream for the duration of the loving seasons, Spring into Summer. Each morning I read to the water a poem the wind has selected overnight. Slugs are listening too. They develop a fondness for Christopher Marlowe’s The Passionate Shepherd to His Love: “Come live with me and be my love… “ and begin their edit. I work with the materials in my local environment. My practice is largely photographic, and addresses the distinctive character of the woodlands, wetlands and wildlife of rural Norfolk. The work is made in full awareness of philosopher Peter Osborne’s assertion that art is now necessarily an almost exclusively urban phenomenon, and art historian James Elkins’ view that landscape is now ‘dead’ as a subject for ‘serious’ contemporary art in any medium. My challenge to those views has been made primarily through the form taken by the work, where the material texture of place is what counts. 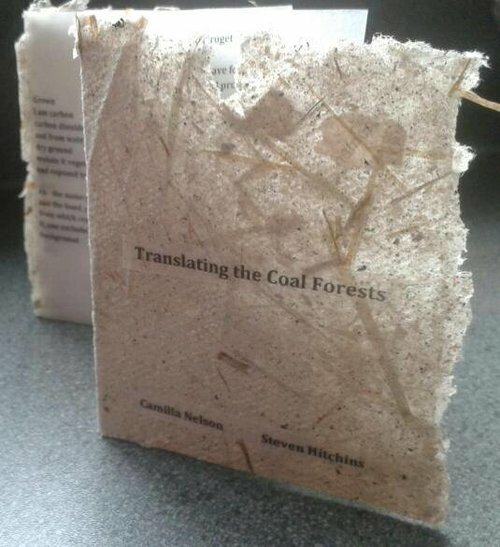 Translating the Coal Forests (2015) is a collaborative bookwork created by Steven Hitchins and Camilla Nelson. Hitchins copied pages of F. J. North’s Coal and the Coalfields in Wales (1931) and suffused them with mud and silt and left them to deteriorate in a South Wales coalfield swamp. After a couple of weeks the text was retrieved. Steven used OCR text recognition programs to take casts or moulds of the remaining text and sent these translations to Camilla. Steven & Camilla worked on the letter combinations delivered by coal swamp decay and text processing software to create their own ‘translations’ or ‘transformations’. The text forms: steadily, dimity. Translating the Coal Forests (2015) manifests a process of material, digital and interpersonal translation. In DECOMP (Coach House Books 2013), poets Stephen Collis and Jordan Scott respond to the still-emerging discourse around “ecopoetics” by returning to the age-old question of the relationship between word and thing, culture and nature, in a highly literal, gestural, and material way: they left identical copies of Darwin’s On the Origin of Specialoutside to decompose for an entire calendar year, photographed the results, and then used to obliterated pages to compose a new text that is both “found” object and reflexive meditation. Each of five books was placed in a distinct British Columbia ecosystem; each location produced unique variations of decomposition. Each decomposed “text” had something to say about its specific place: rain forest, desert grassland, alpine forest, boreal forest, island rain shadow. In the animated poem “heyday”, Shin Yu Pai excavates the history of a city’s relationship to its ecology, from its early days as a center of timber milling to its present day aspirations to extend its tree canopy and engage its local citizenship in environmental stewardship. Working with filmmaker and animator Michael Barakat, the pair took the approach of transforming the poetic text into a shaped, concrete poem in the tradition of visual poetics rendered with minimal artwork or additional imagery. My practice lies at the intersection between textual and textile, exploring and experimenting with the concept of the page and its relation to an embodied sense of language. I both make pages and make texts and this encourages me to be constantly and simultaneously aware of the process of each. I am interested in the materiality of paper as a means to explore the experiential, physicality of communication, alongside situated ecologies. My work looks toward a blurring of the traditional distinction between an active act of inscription and a passive receiving surface (and the accompanying value systems that define this). Vestiges is a collaboration with Camilla Nelson (Singing Apple Press) that combines text and material traces from my performance Cure for Walking C. The work explores gestures of mark-making and inscription across the curved landscape of the Mere Downs with seaweed, salt and charcoal. Corporeal connections across deep time, when land was once sea, are re-written through material exchange. Sarah’s practice works with processes of al-chemical transformation to consider interwoven human-nonhuman ecologies. Last Glacial Maximum’ is a textual exploration of the transformative effects of the last ice age on the landscape of Britain. The work takes as its source a number of key works of early British literature, including John Kemble’s 1837 prose translation of Beowulf, and Michael Drayton’s epic landscape poem, Poly-Olbion, along with other material including Wordsworth’s Guide to the Lakes and various technical essays on glaciation. These works were then ‘agglomerated’ to form textual ‘moraines’ - mimicking the process whereby the motion of glaciers creates vast deposits of lithic material prised from the underlying rocky substrate. The resulting text is unreadable in the conventional sense but offers a more oblique, visual narrative for the eye to follow. My visual work explores the boundary between text and assemblages of found chattel as totemic objects, portraiture and text in reference to poetry. I create within the field of view, arrays of objects and sometimes people, in order to create a world in which the items on display create a compositional grammar that explicates on the ritualized world that surrounds totemism. ‘What sprouts from the earth returns to her womb’. The poem was made with 794 sprouts pinned to a dead tree for LandArt Diessen, the Netherlands, in September 2012. On-Site Poetry is a partnership between writer/performer Nick J. Swarth and designer Sander Neijnens. The started making poems in public space in 2006. Since then they have been commissioned to make over thirty artworks. The texts and design are always inspired by the specific location where the work is made. It's Nice Here is made from sheep's wool on a fence that divides the campsite at Maker Heights in Cornwall. The art work is a text piece saying “The Rest of the Universe is 62 Miles Above Sea level“ . The letters are made out of felted wool and felted to the fence. The material chosen was inspired by little bits of sheep wool that gets caught in fences. Theodore van Karman calculated in 1963 that 100km up is where aerodynamics stop and astronautics begin. The Karman line has been suggested as a jurisdictional line. Below this level air-space belongs to each country. Above this level there would be free space. The rest of the universe. Luke Allan is a poet and editor. His poems and artist books are frequently inspired by experiences of walking and camping in wild landscapes, in particular the small islands off Scotland's west coast. The poem-prints in Radical Landscapes invite quiet contemplation. The words and their arrangements are a choreography; by reading them, an experience or sensation is recreated: birdspotting on a mountain top; looking down at a river in the spring; following a path to the sea; watching the sun rise in the morning and set in the evening. In the heart of London lichen grows on a concrete wall. Largely unobserved it has survived for years and years in a microclimatic church garden. On closer inspection the lichen becomes a map. ‘“Do you realize” the phytolinguist will say to the aesthetic critic “that [once upon a time] they couldn’t even read Eggplant?” And they will smile at our ignorance as they pick up their rucksacks and hike on up to read the newly deciphered lyrics of the lichen on the north face of Pike’s Peak.”’ – Donna Haraway. As will be clear from my published work and essays, my scores do not always rely directly on alphabetical forms; but knowledge of semantic writing and its multivoice and polyvocal performative utterance do underlie everything I make in this and other endeavours. In Porth Dances and Sings # 1 digital photographic images of Porth Conger, Isles of Scilly, in its fast-rising tide, have been treated to make them useable as parts of a score. My work is about perception: I have observed that we have a psychological bias towards peripheral or central focused vision. My paintings feature two elements: gestural underpainting for emotion and intensity, and difficult to read text representing a code that conveys the meaning. The script is a form of dialogue with other languages. Contemporary Art questions who we are now, and writing places my view in this universal question. ‘At Bathroom Mirror (Descent)’ features my poem ‘Performance’. I made a series of paintings using the moat garden at Windsor Castle as the central motif. The under-painting was completed at an art competition held as part of the Queen's 90th birthday celebrations, and I wrote the poem musing about the anxiety of competition and the process of painting. The title refers to the start of the poem, and inheritance, the topographical features of a moat garden and the class structure of monarch to subject. Our cross-disciplinary collaborative practice between poetry and visual art explores open, environmentally-aware engagements and methodologies with landscape and place. We investigate the relation of social, environmental and energy politics on micro and macro scales, looking out to land and sea and back to the community. We are interested in the effects of radical open form text and paintings presented innovatively together and how this challenges audiences' assumptions. The Gathering Cloud is a web-based work which attempts to call attention to the environmental impact of so-called cloud storage through the oblique strategy of calling attention to the materiality of the clouds in the sky. Both are commonly perceived to be immaterial. Both decidedly are not. Commissioned by NEoN Digital Arts Festival The Gathering Cloud won the New Media Writing Prize 2016. A print book by the same name was published by Uniformbooks in 2017. ‘Reading The Ruin’ uses sound and image to create textual experiences built on simultaneous voices. It stems from a reflection concerning the idea of the ruin and its polyvocal evocative nature. It is composed of three poems, assembled through sound and image to construct two outcomes, a series of five visuals and a sound piece. The visual pieces are structured to form dense and delicate typographic compositions, the palimpsest-like textures of which invite the reader/viewer both to approach it as an abstract textual landscape and to navigate between its layers of meaning. In the sound piece, the three voices fluctuate and overlap, allowing the listener to travel freely across its narratives. Hanna Tuulikki’s Air falbh leis na h-eòin | Away with the Birds is an innovative vocal composition that explores the mimesis of birds in Scottish Gaelic song. Commissioned as one of the closing events of the Glasgow 2014 Cultural Programme, it was first performed in the dramatic setting of the Isle of Canna’s historic harbour. The music responds to the islands topography, the co-existence of tradition and innovation, and the delicate equilibrium of Hebridean life. The music weaves together fragments of songs and poems that are imitative of birdsong, and, over five movements, guides us through communities of waders, seabirds, wildfowl, and corvids, evoking sea, shoreline, cliffs, moor, and woodland habitats. The ensemble sing the sea and the winds, the motion of birds – wading on the shoreline, swooping before the cliffs, and beating skeins – and, as the music ebbs and flows, they call to mind the eco-tones where species meet. As I walked, I became increasingly aware of being in an ancient landscape where others have been before me and of water, wind and the environmental, social and cultural importance of it. I recalled seeing an ancient hydrology system that is still visible in the landscape. I spent time with a singular alder tree that grows where a relic water source once flourished and late one afternoon, I laid out a concertina book on the surface of the sun-baked ground and set up the faciltity for a narative of wind, land, water and tree – a memory of absent water, a fluid act of inscription. Between a small forest of coniferous and mixed deciduous trees (supporting maple syrup production in late winter) and the playing fields and outbuildings of an agricultural college turned community asset is an abandoned black walnut grove in an otherwise open field. Throughout 2017 Cecilie Bjørgås Jordheim together with the initiator of the project Chris Turnbull placed ten blank scores (with hand-drawn horizontal lines in ink on unlaminated paper) on metal placards in that grove one set for each season. Flete is an artist’s book that writes against the flow of a stream. It thinks about the contingency of writing as it skims over the surface of the world. It began with mud and silt dug at the lowest tide of the year from the estuary where the Fleet stream meets the River Dart, at Warfleet, Devon. The sequence concerns the long geological time of rising sea levels and lived predictions of change. ‘Scrub’ is defined as a habitat dominated by shrubs or bushes, forming the margin between grassland or heath and woodland, and in coastal locations. Now recognised as ecologically valuable, it is also seen as a threat: scrub encroaches, and its species can be invasive. In built environments, scrub marks the ever-moving border between the human-made and the other-than-human. 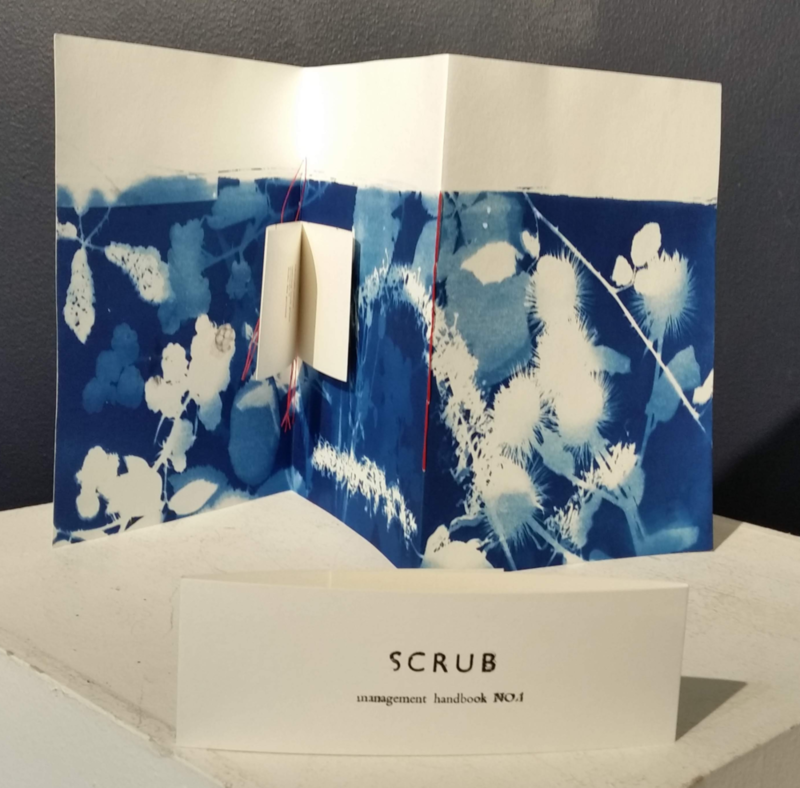 SCRUB Management Handbook is a series of poetic and language art works, this first series undertaken during a five-day residency at Singing Apple Press in Mere, Wiltshire. a watercolour incorporating collage, gold-leaf and very fine gold wire, formed part of a collaboration with poet and essayist, Kathleen Jamie, who approached Brigid to work with her in processing her experience of breast cancer and resulting mastectomy, leading the pair into a series of conversations. These encounters evolved into a series of prose poems written by Kathleen during her recovery that went on to become woven into artworks by Brigid and were published in a limited edition book, ‘Frissure’ (Polygon, 2013), with the support of Durham University Centre for Medical Humanities, Creative Scotland and The Wellcome Trust. To immerse oneself in any landscape for an extended duration, is to allow place, and its multiple narratives to unfold through the imagination, and subsequently the creative act. To the sensitive mind, residing in a place and slowly attuning to it’s rhythms, flows, and energies allows one to become a conduit through which the land might be given voice. This poem, one of a sequence written in response to artwork by Robert Filby, is the end-product of a series of processes and transformations, starting with a transposition by the artist of a square of Ordnance Survey Explorer-series mapping of an area of East Anglia into a moulded relief of its contours: a scaled-down material representation of topography. Stripped of its cultural and geographical references, the artwork appears to be simply an abstract relief, with blank space in the top two-thirds of the pictorial plane balancing more detail (ridges, hollows, grooves and curved and branching lines) in the bottom third. My piece is an attempt to affirm the appeal of the work’s abstraction, while at the same time re-inscribing particular features of the landscape (trees, rivers, fields) onto a flat version of the picture plane, itself compressed to a conventional ‘landscape’ format. Andrew Fentham is a writer, translator and artist based in Cornwall. His text-art installations have appeared at the Hatton Gallery, Fascinate Festival and Penzance Literary Festival. A debut poetry pamphlet, Romanesco (Eyewear), appeared last year. A vis-po pamphlet, Hunglish (Broken Sleep) will appear next year. I am a visual artist living in Belfast. Making objects of nature subjects of culture is at the core of my practice and I want to challenge where the current condition of nature resides as a subject for artistic intervention and discourse. Much of my work revolves around walking and mapping and the exploration of alternative representations of the mapping process. I make maps of my journeys through an automated drawing process based on my movement through space. It is mark making in landscape which can be read as experiential. The marks are the language of movement.